This book wasn’t written as a book. It is a sequence of letters to the poet’s wife, written in 1907 from Paris. Its intertwining themes and motives emerged organically — as though designed by the unfolding of life itself, both within Rilke’s inner space, and outside. The Rilke we hear in “Letters on Cézanne” is not yet the Rilke we know from his mature work. He is right in the midst of becoming the artist he is destined to become. And these letters are not only on Cézanne, not only on painting — they record and embody this act of becoming, forged in a synergetic fire between poetry and painting, between words and colors. … seeing and working—how different they are here. Everywhere else you see, and think: later—. Here they’re almost one and the same. You’re back again: that’s not strange, not remarkable, not striking; it’s not even a celebration; for a celebration would already be an interruption. But this here takes you and goes further with you and goes with you to everything and right through everything, through small things and great. Paul Cezanne. Still life, bowl and Milk Jug. C. 1877. Click to zoom in on Google Cultural Institute website. PRESENCE (a concept much less in vogue back in 1907 than it is now) is one the core themes of the book. Here, Rilke links it to a place, to being in Paris (he had returned there several days before). Although Cézanne is not present in the letter (at least not explicitly), this small still life jumped at me as a perfect companion to it, so full it is of the same urgent presence. 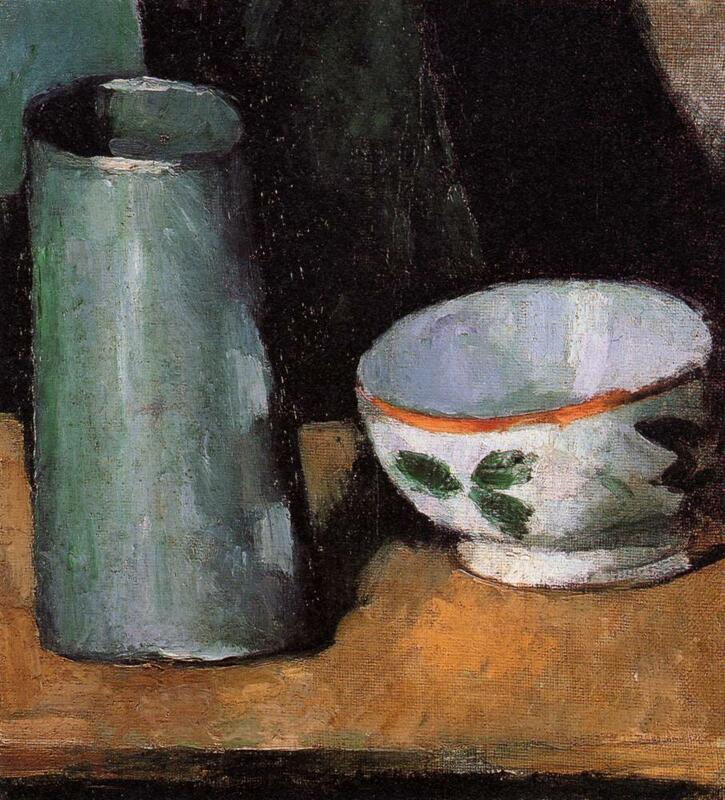 In later work, Cézanne would arrange complex still life set-ups, but this one is so utterly simple. It is a kind of “composition” every one of us passes by multiple times every single day without noticing. Two things lined up in formation on the kitchen table. Just two things on the kitchen table — what is there to notice, to pay attention to? Even most painting textbooks would advise that two things never make a good composition. In Cézanne’s eyes, they are “utterly and urgently present, as if prostrate on its knees and praying for you …”. This is the visual experience shared in this painting, and now it is up to us to expand it from the space of painting and into the space of our daily lives.